I'm watching the news conference online with 1192 other viewers. There's a little counter that shows how many viewers there are. It's up to 1217 now. Never got beyond about 3000. President Obama is coming out now. He's going to talk about the next chapter in the story started by the inspirational time of the '60s where we were racing against an adversary. Now space exploration is more of an international collaboration. Well considering India had a bit of a disaster today, I think we need to analyze if this will bring the average accomplishment up or down. What if it turns out like mainstreaming gifted children? Obama mentions the deeper worry of people involved in the space program that stems from the sense that Washington doesn't get it. The last administration didn't provide clear objectives or the budget to achieve it. All that has to change. His plan calls for increased earth based observation to protect our environment for future generations. And he talked about crewed flights (I thought he said crude flights, but that can't be right) -- more of them in the next decade than previously planned. And he wants to use the ISS for its intended purpose, testing to reduce the cost of future missions to space. There was applause when he mentioned using the private sector to get us to space cheaper. He thinks it will accelerate innovation. The question, according to Norm Augustine, the speaker following Obama, is do we have more faith in our aerospace industry or the Russian aerospace industry to get us into space? Obama promises $3 billion for development of the new heavy lift rocket. New designs, new materials, looking at not just where we can go but what we can do when we get there. 2015 is the end of design and the start of construction. He mentioned landing on asteroids and moons of Mars. Obama thinks going back to the moon is silly. We've been there before. We should work on harder targets. This sounds about like what Dr. Tyson said on Tuesday. We don't want to just extend humanity's reach in space, but improve technology here on earth. For pennies on the dollar the space program has provided innovation. The origins of NASA was an endeavor that pushed our capacity as human beings to solve problems. President Obama asked the audience to continue. "I know you will, with ingenuity and intensity because that's what you've always done." Obama's plan adds 2500 more jobs ABOVE the plan of the previous administration. I'm still not sure how much that really balances the losses though. I read somewhere 7000 will lose their job from the shuttle shut down. He promises 10,000 jobs nationwide in the next few years. "It's true there are Floridians who will see their jobs disappear as the shuttle program winds down," he said. Obama has commissioned a $40 million initiative to develop a plan by August 15th for how to prepare an already skilled workforce for the next step. He made a very clear promise that he would help in the transition for people who are going through a tough time. He mentioned the people who would lose their jobs over the shuttle shutdown worrying about not only their own livelihood, but the collapse of a program that was their life's work. This is the important issue to me. I'm bummed out about my own career at this point, but I'm really freaking pissed off about the bigger picture. Maybe this extends to other people in the business of technology. I'm upset by the loss of momentum of innovation. Those of us who understand physics appreciate the efficiency in keeping objects in motion moving. Once you let them stop it is much harder to get them going again. Static friction versus kinetic friction. It's like turning the wheels on your car with it sitting still. It is WAY easier if you roll forward while you crank on the steering wheel. 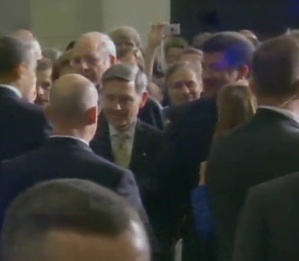 I took a screen shot off the live feed when Obama shook hands with Dr. Neil DeGrasse Tyson because I thought it was interesting that they were both so much taller than everybody else around. I missed the perfect instant when Obama clapped Tyson on the shoulder.